Blackheads are one of the most annoying and invasive skin problems that everyone gets at one point in their lives. 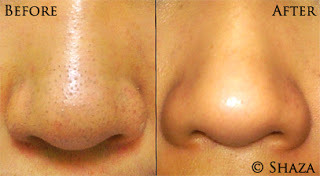 Unfortunately for most of us though, blackheads are a consistent and recurring annoying that just NEVER goes away! You can spend hundreds of dollars on blackhead remedies such as nose strips and scrubs, but do they ever really go away? That’s a hard NO! Fortunately though, there IS a completely natural way to scrub away blackheads for good as long as you’re consistent with it! Today we’ll show you how to use baking soda for blackheads, and once you do, you’ll never go back to use pore strips again! Baking soda is a natural exfoliant as well as a natural lightener, so when it’s used on the skin, it works hard to remove dirt, pollutants, AND blackheads by gently scrubbing them away. The reason baking soda works better than any store bought scrub is because it’s entirely natural and also contains a bleaching agent which helps to remove blackheads as well as treat acne scars, dark spots, and sun spots too. In this recipe, baking soda is mixed with honey and salt to become the ultimate blackhead fighting treatment. Honey is a natural anti-septic and is often used in anti-acne treatments, and so it’s only normal that it would fight blackheads too! Salt is added as another layer of exfoliation since blackheads are so incredibly stubborn. Read more below to find out how to use baking soda for blackheads! In a small bowl, stir all ingredients until they form a smooth paste. Apply the paste to the affected areas such as nose and/or chin, and leave on for 5-10 minutes. Scrub in slow, circular motions to exfoliate and remove blackheads and rinse off with cold water. Pat dry and follow up with a light moisturizer. Note: Because baking soda and salt can both be a little abrasive, use no more than 2-3 times a week, making sure to leave a day or two in between uses. As always, test an area first to make sure you’re not allergic to any of the ingredients!